With the powerful camera set, people enjoy taking photos with iPhone, and it’s also gorgeous with various apps to edit and beautify your pictures. But what after you edited your photos, do you know how to import photos from iPhone? Follow this guide to easily transfer iPhone photos to computer. When you connect iPhone to computer, generally you will see the AutoPlay window popping up on the screen. It’s the easiest way to transfer iPhone photos to your PC. Click on the AutoPlay “Import pictures and videos”. A small window will then appear on the bottom right to estimate the total of your photos. Optionally you can tag these pictures, and then click Import to get all images to PC. Alternatively, you can click “Open device to view files” on AutoPlay and go Computer > your iPhone > Internal Storage > DCIM to get your all photos. If you accidentally close the AutoPlay prompt or just don’t see it, you can directly open the Windows Explorer > My Computer > iPhone disk under Portable Device, and click into it. Notes: Please make sure you choose “Download and Keep Originals” on the iPhone Settings > iCloud > Photos if you’ve enabled iCloud Photo Library, or you won’t get all your photos on computer with this method. We know that we can sync our iPhone photos remotely among Apple device with iCloud Photo Library enabled, and now this feature also save a lot of space on iPhone by “Optimize iPhone Storage”. If your iPhone don’t have enough space for you to download all photos to move to computer, you can choose to download them directly from iCloud. 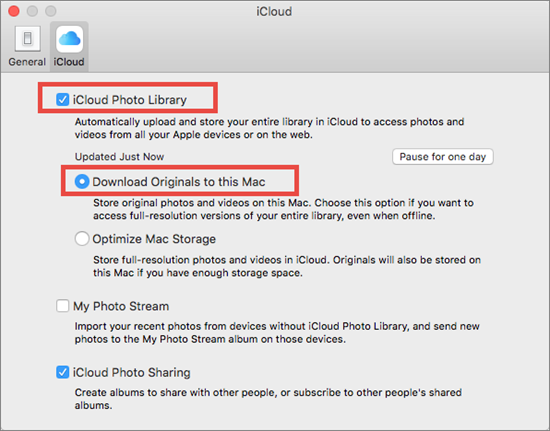 There are two ways to download photos from iCloud: one is going to iCloud.com and sign in your iCloud, then download photos one by one from iCloud > Photos; the other is to install iCloud software on computer, which is good for downloading all photos and videos in one click, and you just need the following steps. Install iCloud on your computer and sign in with Apple ID. 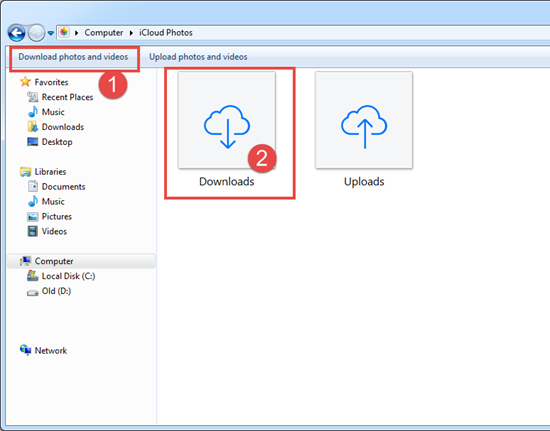 Open iCloud Photos in Window Explorer, and click on Download Photos and Videos on the top left. The process may take time. You can constantly refresh the Download folder in iCloud Photos to check the result. Open Photos app on Mac and click Photos in the menu bar to enter Preferences. click on iCloud and, make sure iCloud Photo Library and Download Originals to this Mac are selected. Tap on File > Export on the menu bar to “Export Selected items…” or “Export Unmodified Original For Selected items…” accordingly, and then click Export to start downloading photos to your mac. For Mac users, it’s well known that you can directly import photos via Mac Photos app. 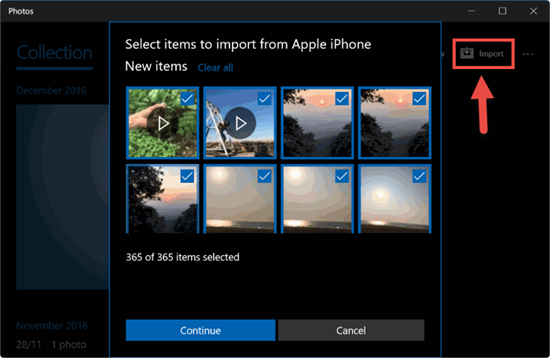 Similarly, now Windows 10 users also have a Photos app to easily import photos from iPhone. Preparation: Make sure you have the latest iTunes installed on your Mac. Connect your iPhone to your Mac and open Photos app. Click on the Import tab at the top or the device’s name on the sidebar. 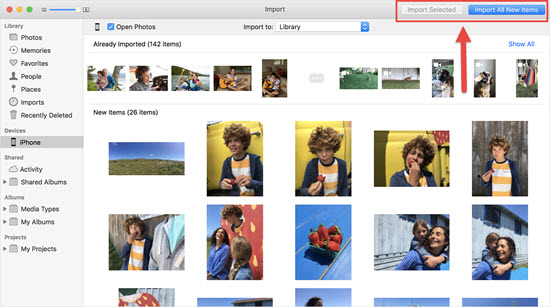 Select the photos you need and click on Import Selected to get photos off iPhone. If you want all new photos, click on Import All New Photos. Connect iPhone to the PC, and then open the Photos app. Click Import at the top right and select the photos. 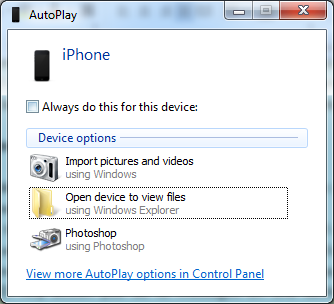 Click on Continue to transfer photos from iPhone to PC. 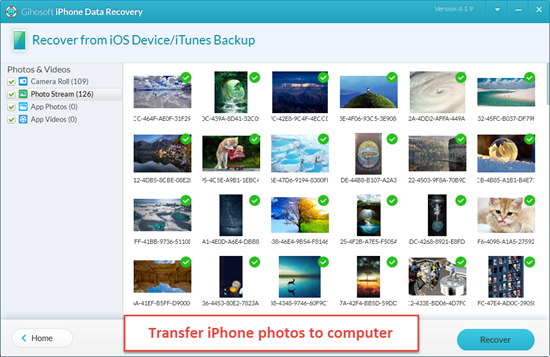 Aside from photo recovery, Gihosoft iPhone Data Recovery software can also be used as a tool of transferring photos. 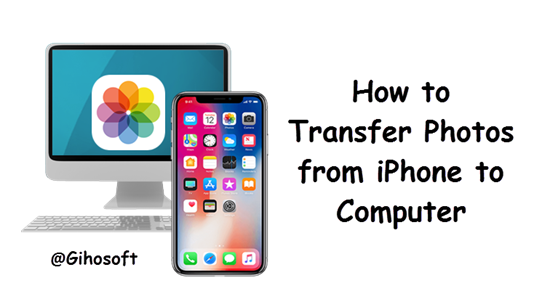 Follow these steps to transfer photos from iPhone to computer. Step 1: Run Gihosoft iPhone Data Recovery and select Photos & Videos. Step 3: Click on Recover to export photos from iPhone to computer. Note: If your photos can’t be opened as JPEG on computer after transferred from iPhone, it may be the HEIC format problem. Read the guide on How to convert iPhone HEIC photos to JPG to easy solve the problem.